The above billboard, on Lincoln Blvd. in Venice, California, is directly across the street from a church with a Head Start pre-school and after-school arts program for teenagers on its property. Such billboards close to schools, playgrounds and other areas frequented by children and youth are not uncommon, despite the outdoor advertising industry’s touting of its “code” limiting placement of signs advertising products illegal for sale to minors. We are careful to place outdoor advertisements for products illegal for sale to minors on advertising displays that are a reasonable distance from the public places where children most frequently congregate. We support reasonable limits on the total number of outdoor advertising displays in a market that may carry messages about products that are illegal for sale to minors. 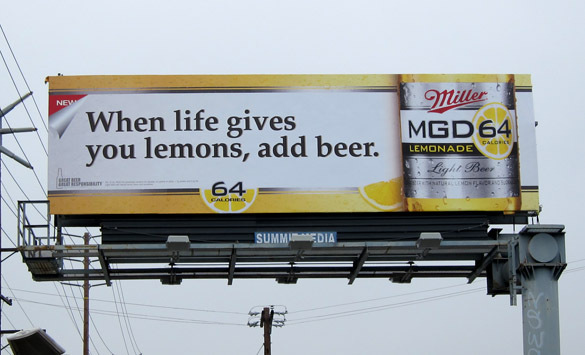 The Summit Media billboard advertising Miller’s new lemonade-flavored lite beer is just over 120 ft. from the church grounds. Other companies that have placed billboards advertising alcohol closer than 500 ft. to churches and schools in Los Angeles are Clear Channel, CBS Outdoor, and Lamar Advertising.